Isagenix Ionix Supreme £ £27.00In stock! Order now! Would you like more energy, less stress, and better physical and mental performance? Isagenix Ionix Supreme is the solution. This scientifically formulated herbal tonic utilises over 100 adaptogenic herbs and select botanicals. Find out more by downloading the product information guide here. Developed as an all-natural stress reliever, Isagenix Ionix Supreme is a natural tonic loaded with over 100 specially selected herbs, botanicals, and other nutrients proven to lower stress levels, increase energy, and promote a healthier, happier you. 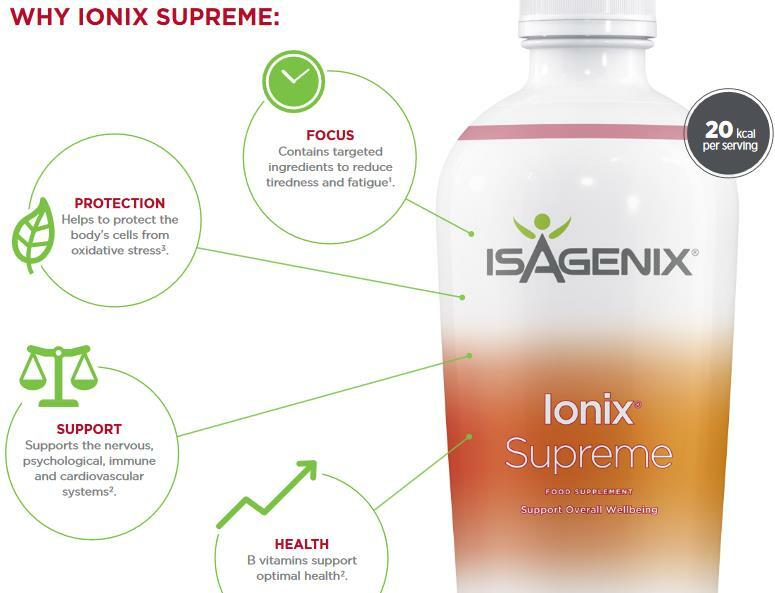 Now featuring a new supercharged formula with even more plant-based nutrients, the new and improved Ionix Supreme provides your body and mind with a wealth of benefits. For the best results, Ionix Supreme should be used alongside other Isagenix products as part of a comprehensive nutritional cleansing programme. The wide assortment of antioxidants found in Isagenix Ionix Supreme help protect the body from damaging toxins, free radicals, and other impurities. 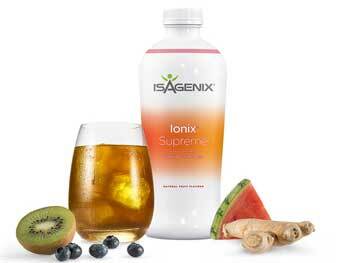 Meanwhile, Ionix Supreme’s powerful blend of adaptogenic herbs help the body fight both fatigue and stress. Used in Chinese medicine for centuries, the herbs work synergistically within your body and provide you with the mental and physical boost you need to perform at your absolute best. What Makes Ionix Supreme So Unique? There are a tonne of energy drinks on the market these days, but Ionix Supreme is much more than an energy drink. Rather than using stimulants with negative side effects, such as caffeine and taurine, to provide a quick energy fix, Ionix Supreme ustilises a scientifically proven blend of powerful and all-natural adaptogenic herbs to neutralise stress, boost energy levels, and help get your body into perfect balance. Much more than a quick energy fix, Ionix Supreme can be used every day as a long-term stress reliever and gentle cleansing solution. Adaptogenic Herbs – What Are They? Ionix Supreme contains herbs like wolfberry, rhodiola rosea, ashwagandha, and bacopa, which are largely unknown by the masses. However, these herbs have proven adaptogenic properties, which simply put, means they’re able to create a stress response and help your body tackle the stress and fatigue associated with our modern, busy lifestyles. We recommend using Ionix Supreme along with other proven Isagenix products as part of a comprehensive nutritional cleansing programme. Although you can experience significant results using Ionix Supreme all by itself, we recommend the Isagenix 30 Day Weight Loss System in order to enjoy all of the benefits nutritional cleansing has to offer. Ionix Supreme is included in this comprehensive programme along with a variety of other products serving as proven pillars of bodily health. Isagenix Ionix Supreme can be purchased for £41.33 per bottle at full retail prices, or sign up with us (UK’s #1 distributor) and pay just £31 per bottle. Each bottle is 946ml. Read Isagenix Ionix Supreme reviews from real Isagenix UK customers!